We slept comfortable in our sandy camp spot on the ridge, and woke-up excited to hike down to the Paradise Valley Cafe, just one mile west on Highway 74 (the PCT crosses it at PCT mile 152). 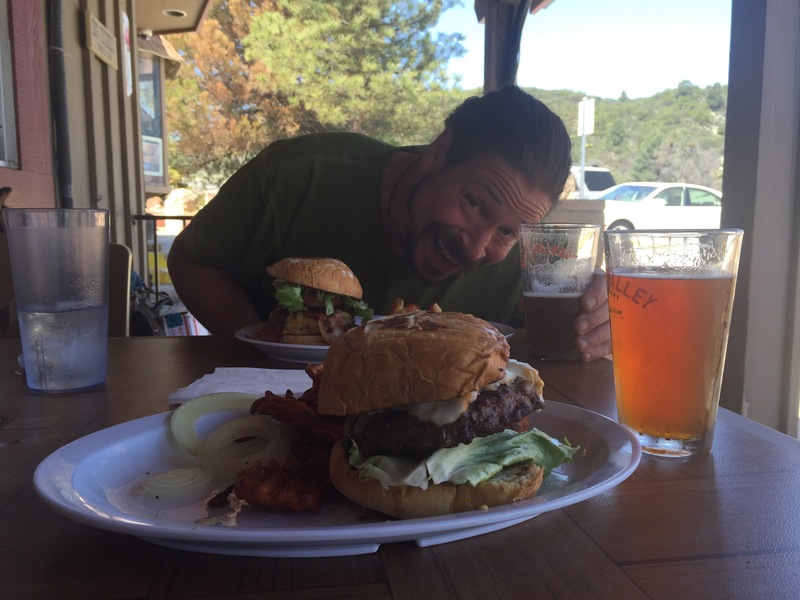 We had a food drop mailed to the cafe, and we were excited to try their burgers this time! The hike went relatively quickly, and we arrived at the cafe at 1030am. We picked-up our package, and ordered burgers. I got the Mercedes burger, with sauerkraut, German mustard, and munster cheese- and a side of sweet potato fries. Garrett got the Route 66, which involved avocado and BBQ sauce. We both had beers. It was all awesome (and all consumed)! My blisters are getting better, the new shoes really helped, but they still need time to heal. To give them an extra boost, we decided to take the rest of the day off from hiking. We found a hiker taxi at the Paradise Cafe, and the driver- Nick, offered to drive us to the hiker-friendly town of Idyllwild that afternoon AND pick us up the next morning at 6am to bring us back to Mile 152. Once in town we caught-up with some hiker friends who were a day ahead of us, did our laundry, ran some errands (getting more bandaids and Advil! ), and found a hotel. That night we went out to to dinner at Restaurant Gastrognome, and called it an early evening to wake-up early the next day! On day 9, we woke-up and drank coffee in our hotel room waiting for Nick. He showed-up as promised, and brought us to the trailhead. 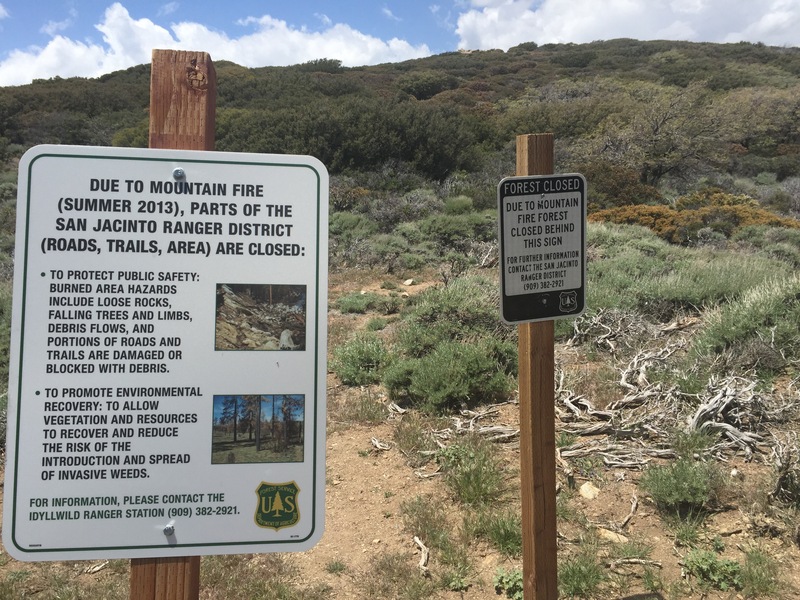 Many hikers choose not to hike this section of PCT, as it is closed from mile 162-178 due to a fire in 2013, which resulted in a landslide that erases the PCT in that area. There is an official reroute, and a couple other options, both of which involve a bit (or a lot) of a road walk on Highway 74. We were curious to see what the PCT looked like leading-up to the closure, so we decided to cobble together two of the suggested reroutes to see. From mile 152, 10 miles of the PCT are open. 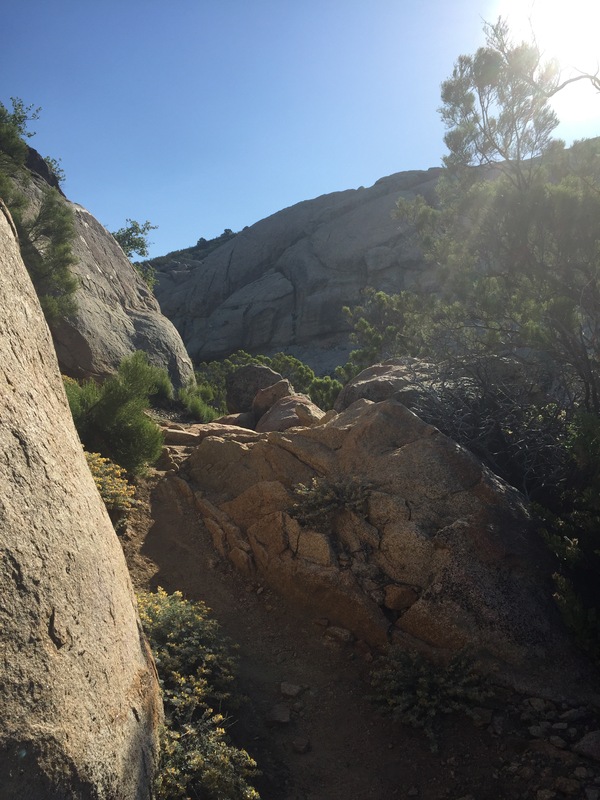 We started there, and went through a bunch of neat rocks and boulders before we slowly made our accent up to the ridge. The ridge was windy, but had great views of the desert on the other side of the mountain. We reached the closure, and descended all the way back down to the valley on a trail at first, and then a dirt road, per the official reroute. We got back down to highway 74, and walked a few miles along the wide grassy shoulder of the road. We started to get a bit tired of the road walking, and it was starting to rain, so we through out a thumb and were picked-up quickly by a resident of Idyllwild. He said the town newspaper encourages residents to pick-up PCT hikers! He took us 3 miles up the road to Lake Helmet Market, where we waited out the rain and had some snacks. We finished up the day with a half a mile walk to Hurkey Creek Campground and called it a day! WHEN DO YOU RETURN TO HARPSWELL? HAPPY NEW YEAR!!! We’re back, but leaving again soon for another journey. This post should have gone out months ago, but for some reason it didn’t-whoops! Happy New Year!